Madura Island known for bull racing. bull racing that took place between August and October every year. 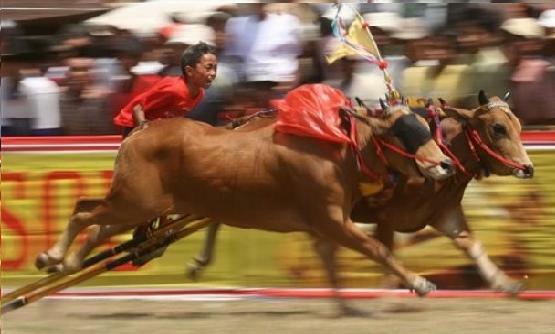 Racing the use of two cows which united or tied to a wooden handle that only about 100 meters. karapan cow was also wearing a jockey for control of cattle and encourages her to be able to run at maximum speed. Generally jockey karapan cow is a child, a jockey is tying his feet on the wooden handle that is used to unite so that they are not thrown off a cow when the cow is running fast, the jockey also brought cows pacemaker made from wooden sticks a nail tip. he put the nail in the wood so that the tip of a cow in pain and can run very fast. But before I get such bad treatment karapan cows treated even exceed the acceptable limit, the owners of these cows can cost tens or even hundreds of millions to take care of the cow. if the cows are getting the champion beef prices will rise high!